August 2012 – My Story – ISB and beyond !!! Played mrudangam for the vocal concert of Shri R. Suryaprakash. The concert was organized during the chaturmasya vratam of the acharya of Shri Chakra Maha Meru Peedam at Ambattur, Chennai. Shri Suryaprakash sang very well. Performing at venues different from the usual city based auditoriums somehow always has its charm and this one was no exception. Overall, a very satisfying experience. Played mrudangam for the vocal concert of Vikram Raghavan. 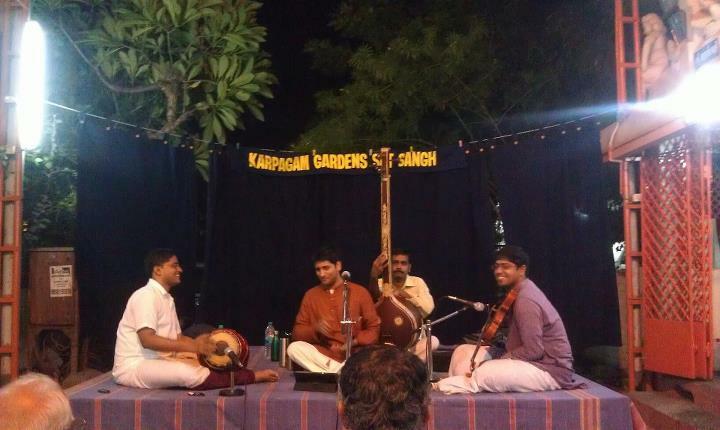 The concert was organized by Karpagam Gardens Sat Sangh, Chennai as a part of their Gokulashtami Celebrations.